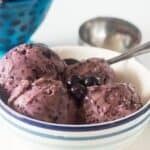 Vegan blueberry ice cream recipe – save a ton of money by making this two ingredient recipe from the comfort of your own home using a food processor. 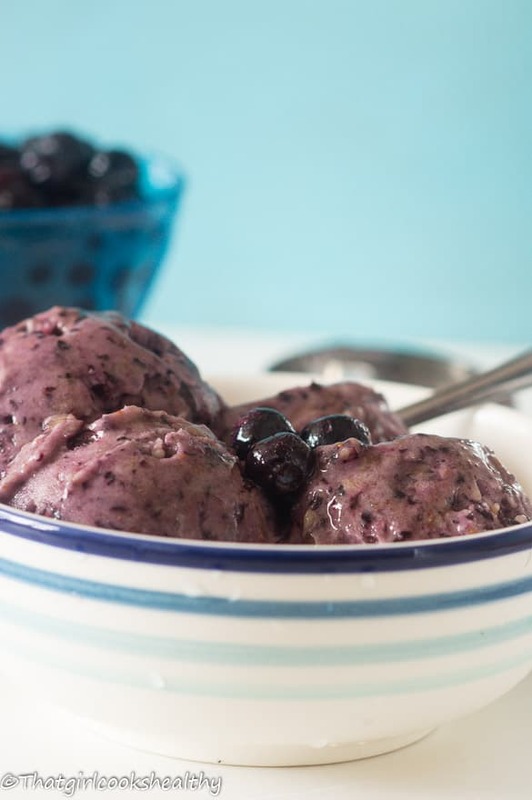 One of the best aspects of summer has to be eating some good vegan blueberry ice cream. Prior to going dairy free I used to be a Magnum and Ben and Jerry’s type of girl. I recall consuming large quantities of both ice-cream specifically on a Friday night with a good movie. I think it’s safe to say that most people enjoy ice-cream and Popsicles to boot. Here the UK the sales soar during the warmer season, although Ice-cream is accessible all year round people tend to buy them more when it’s hot and the sun is shining. It puts you in an even better mood when eaten in season in my humble opinion. Sometimes it’s really difficult to find a good dairy free Ice-cream when you’re lactose intolerant. You constantly have to worry about the additional ingredients in the ice-cream, whether they will cause even further adverse effects. My motto is if you cannot pronounce the word, why would you even consume it? It could be absolutely anything? Furthermore, how will your body respond to said ingredient. As I dodge and weave my way around dairy I’ve found that frozen bananas make a really good batch of ice-cream. Now of course you have to be open minded, if you don’t like bananas in the first place then my two ingredient recipe probably won’t be your thing. However, I have found that bananas do make a very good base for flavouring raw ice-cream. For instance here I made some two ingredient vegan fresh blueberry ice-cream. I added more blueberries to the ratio of bananas in order to overpower the taste of bananas. Yes it’s not the same as adding some eggs and milk BUT……. when you’re intolerant you have to be creative and think outside of the box. 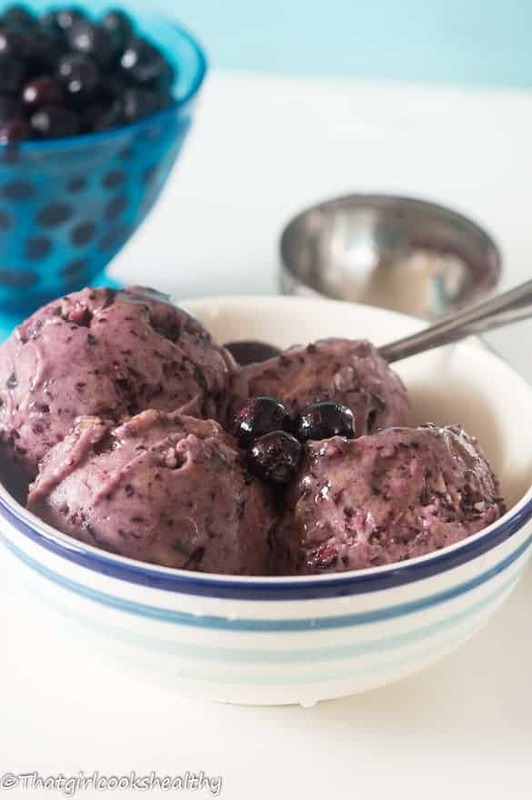 I’ve been eating this vegan blueberry ice cream religiously and absolutely love it!! Make sure your fruit is FROZEN. Also, you don’t need fancy machinery either, just a food processor, frozen blueberries and bananas. The more blueberries used the stronger the taste of blueberry, keep that in mind. Fit a food processor with an S blade. Add the two bananas to the food processor and proceed to pulse. As the food processor begins to pulse the bananas, leave the machine to continue to run while carefully pouring the blueberries into the spout. Once added continue to pulse into a soft combined ice cream consistency, you may need to stop the machine and scrape the sides a few times. Once the ice cream is done, serving accordingly. oh I crave ice cream like nobody’s business. This type of treat saves me from growing out of my jeans. I keep frozen fruit in my freezer for this all the time. Yay! It’s guilt free so you don’t need to worry about any excess weight gain. I love homemade ice cream! So delicious and only 2 ingredients to make. I am ready to make them! This ice cream is exactly what I need. First of all because it’s so hot in here. Moreover it’s a blueberry season and there are tons of these berries sold at farmers’ markets now! Thank you. I made sure to time the posting with blueberry season. I would never have guessed from the pictures that this wasn’t an ice cream with dairy in it! 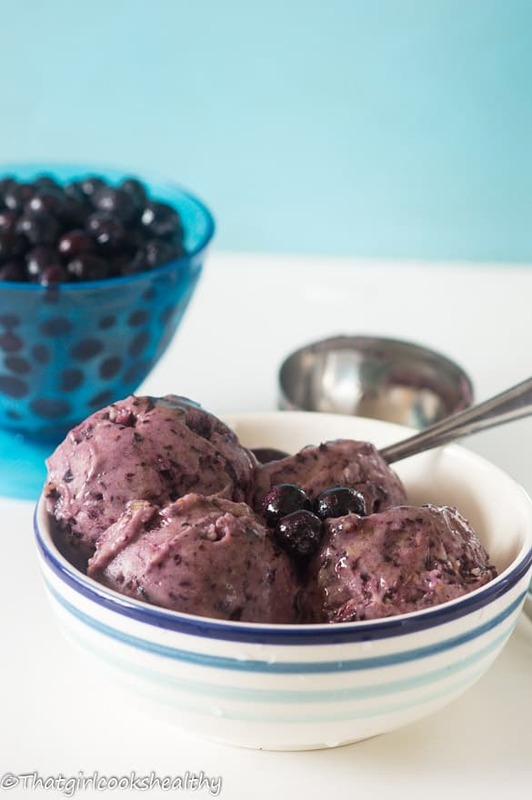 Your Fresh Blueberry Ice Cream looks so good and it fits perfectly into my healthy eating plan! Love this easy, wholesome and oh so delicious recipe. Thank you April, glad to hear my ice cream ties in with your healthy eating regime. Wow Charlene! This is one of the healthiest ice cream I have come across. I could definitely use this right now with all the blueberries floating around. YUM!